A gathering of worshippers is singing in a white-brick church in the town of Laiza in Kachin State, near Myanmar's border with China, but it is not a day of celebration. They are commemorating those who have died since fighting broke out on 9 June 2011, when a 17-year cease-fire between the Burmese government and the Kachin Independence Army (KIA), who have been fighting for greater autonomy for the past six decades, collapsed. Sporadic attacks have continued over the last 12 months and the number of internally displaced persons (IDPs) has risen, aid workers say. "I started running for my life when I was sixteen years old," said Seng Jatdu, 64, leader of the sprawling Je Yang camp, tacking a photo of a dead soldier onto a wooden board covered with pictures of burnt homes, dead soldiers and displaced civilians. He fled attacks in his home area after a coup in 1962, which marked the beginning of political dominance by Myanmar's military. "It is important to document the atrocities of the Burmese army, and it serves as a memorial for historical purposes," he said. More than 6,500 civilians now live in makeshift bamboo huts in Je Yang, one of the state's largest IDP camps, getting by on basic rations supplied by the Kachin Independence Organization (KIO), the political wing of the KIA, and an umbrella network of local donor and community groups. A letter addressed to Myanmar President Thein Sein on 5 June, endorsed by over 50 civil society groups, said human rights violations committed by soldiers against civilians are commonplace. A recent report by Human Rights Watch (HRW) said both sides of the conflict were responsible for serious abuses, including using child soldiers and antipersonnel landmines on civilians. UN figures put the total number of IDPs in Kachin State at over 62,000, including 24,000 in government-controlled areas, and close to 40,000 in KIA-controlled areas. Another more than 7,000 displaced people are estimated to have fled across the border into China. KIO officials quote slightly higher figures, but it is difficult to determine the exact numbers as many IDPs are staying with relatives or are in unofficial camps in Kachin State. Aid workers say transporting and putting in place adequate relief supplies are a major source of concern. Assistance for the displaced in government-controlled areas is more regular, but remains in short supply to those in KIA-controlled areas. Only a handful of local cross-line Burmese NGOs and community-based groups manage to work on both sides of the conflict. 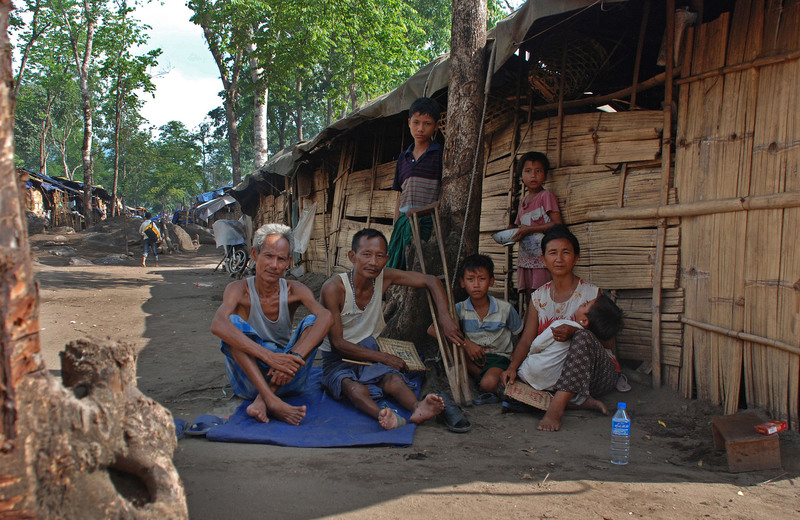 "We received two truckloads of supplies from UNHCR [the UN Refugee Agency] in December , but there were only 300 family kits [consisting of a mosquito net, kitchen utensils, a blanket and a tarpaulin], so we had to split up the items and most of the families went without any extra aid," said Seng Jatdu. At the camp's nearby medical centre, head doctor Sau Myaw, a paediatric specialist recently transferred from the main hospital in Laiza, is treating an elderly man, while her co-workers prescribe medicine for another queue of people. "We have 12 medical staff at our clinic but we are very busy, getting 50 or 60 patients a day. Right now we are facing a shortage of medicines, and a lot of older people are getting sick because of the adverse conditions here." The education of thousands of displaced children is another casualty of the year of renewed conflict. A bamboo-framed school built in 2011 was torn apart by a tropical storm in March 2012, leaving children without classrooms or other facilities, and removing an important focal point in their already disrupted lives. A new brick school is being constructed, with the hope that the children will soon be enrolled. The local government in Laiza has announced that all families in KIO-controlled areas are now exempt from school fees. There are just 40 teachers for about 1,700 students at the camp. Assistant head teacher Mi Tung Roi Jay, 27, fled her village of Gan Dawn Yang in July 2011, when she heard heavy artillery shelling in a neighbouring village. "Last October , during the school break, I went back to my village but all the cows and pigs that we had been caring for were gone." She hopes a cease-fire will be reached soon, but like her parents who fled government attacks in the 1980s, Mi Tung Roi Jay has a deep-rooted mistrust of the Tatmadaw, or Burmese military. South of Laiza, near Mai Ja Yang, another town on Myanmar's border with China, there are more than 13,000 displaced civilians in four camps where supplies are also running low, according to Wun Pawng Ninghtoi (WPN) - "Light of Kachin" - a volunteer group comprising eight local NGOs and charity groups. Access to international aid is slow and only a small number of UN convoys have been allowed access to the region since March 2012. "At the moment we have more than 40 volunteers working hard to aid the IDPs, and our biggest concern right now is food supplies," Hkaw Lwi of WPN told IRIN. The group is also in urgent need of mosquito nets. "We are very worried that there will be many cases of malaria with the oncoming rainy season." Military operations by both sides have continued despite a call by Myanmar's reform-minded president Thein Sein that the army should cease attacks on the KIA, and only fire in self-defence.